Young quarterback Benjamin Anderson tried to make it to the NFL as a free agent this past spring, but it just didn’t work out. A few months later, he is under center taking snaps in the cozy city of Sagamihara, Kanagawa Prefecture. Anderson, a 23-year-old product of the University of Arkansas at Pine Bluff (or UAPB), didn’t know football was even played in Japan before being acquired by the X League’s Nojima Sagamihara Rise over the summer. Things moved quickly for Anderson. He said that his then-agent received a couple of offers to sign with the Baltimore Ravens and Washington Redskins during the free agency period after the draft. However the agent turned down the offers without notifying the player (Anderson fired the agent and has since hired a new one). There were then a couple of clubs from Japan, including the Rise, that expressed interest in the 190-cm signal-caller. “I’m not sure of the other team, but I sent my highlight tape to the Rise,” said Anderson, who joined the team in late July. 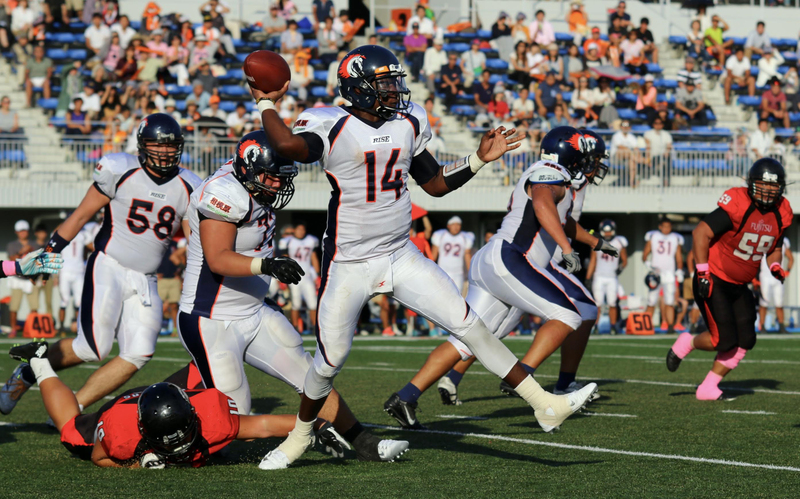 The addition of the American quarterback has paid off for Nojima Sagamihara. The team has a 4-1 record to date, including a stunning 20-17 victory over the powerhouse Obic Seagulls in its second game of the current season. Anderson is happy to have been given the opportunity to continue to play the game in Japan at such a high level. The increase in the number of import players in the X League has certainly raised the overall level of the country’s top circuit. But Anderson has been impressed by the Japanese players as well. Anderson is one of five American signal-callers in the league. He separates himself from others with his mobility. Actually, Anderson, who grew up idolizing players like Mike Vick and Vince Young, doesn’t really count himself in the rushing quarterback category, insisting that he considers himself a QB who sits back and looks to throw first. Anderson still has his eyes set on reaching the highest level of the game back in North America as he racks up experience playing in Japan. “I wouldn’t say I would give up on the NFL, CFL yet,” said Anderson, who’s accumulated 490 yards passing, and thrown four touchdowns, and also rushed for 181 yards and one TD for the X League East team in five starts this season. Pittsburgh — Quarterback Landry Jones saw his first regular-season NFL action for Pittsburgh last week. Now, it looks as if he will make his first start this week. Coach Mike Tomlin said Tuesday that his team will prepare for Sunday’s game against the Chiefs at Kansas City as if Jones will be the starter. Ben Roethlisberger has been out since spraining the medial collateral ligament in his left knee Sept. 27 in a win over the Rams at St. Louis. Backup Mike Vick suffered a strained right hamstring in last Sunday’s 25-13 victory over the Arizona Cardinals. 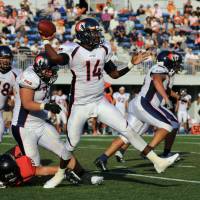 Jones had been the third-string quarterback since being drafted in the fourth round in 2013. He played well against the Cardinals, completing 8 of 12 passes for 168 yards and two touchdowns. “We were not shocked by his performance, but we were pleased by it,” Tomlin said. The Steelers, though, will likely open up the offense more if Jones starts. He had extensive action in the preseason as he played five games rather than the normal four because the Steelers appeared in the Hall of Fame game. “He took advantage of those reps, like we all talked about during the course of the preseason, but regular season is different from the preseason,” Tomlin said.